The congenital condition in which part of the spine is missing, exposing the spinal cord within the spine to the outside, is known as spina bifida. Spina bifida is divided into two types: that in which the spinal cord is covered by the skin (spina bifida occulta); and myelomeningocele, in which it is not covered by skin (open spina bifida) (see Fig. 2). The spinal cord is exposed in myelomeningocele cases, resulting in neurologic disability within the parts of the body below the spinal opening. Myelomeningocele often occurs in the lumbar vertebra or the sacral vertebra, resulting in walking disabilities and inhibiting urination and defecation. Furthermore, as the spinal cord is exposed, the brain as a whole can sometimes droop downwards into a state known as Arnord-Chiari Ⅱ malformation, or the flow of cerebral spinal fluid can be impeded, resulting in hydrocephalus, which in turn can lead to respiratory and developmental disorders. The condition is caused by a proportion of the neural tubes, which are the basis of the brain and spainal cord, remaining open in very early pregnancy. Factors involved in this can include chromosomal abnormalities and the use of drugs, as well as maternal folic acid deficiency; however, in many cases the cause cannot be identified. Fetal myelomeningocele is diagnosed by ultrasound examination, and an accurate diagnosis can be achieved using a precise examination at a specialist facility. MRI is also effective and is sometimes used for precise examination of lesions. In general, infants are delivered by cesarean section in order not to rupture the myelomeningocele. In nearly all infants, surgery to close the myelomeningocele is performed as early as possible (within 2-3 days) in order to prevent infection of the spinal fluid. In cases with hydrocephalus, cerebral ventricular drainage is simultaneously positioned, due to the need to drain the cerebral spinal fluid outside the brain ventricle. If hydrocephalus subsequently continues, a ventricular-peritoneal shunt procedure (V-P shunt procedure) is generally implemented. Following surgery, rehabilitation and other therapies are used to recover as much function as possible. Prenatal diagnosis and appropriate therapy has meant that in recent years, fewer children die of this condition at an early age. At present, the fetal therapy method used most commonly in Europe and the USA is fetal surgery that implements direct repair of the myelomeningocele via incisions in the abdomen and uterus. Fetal surgery, however, raises the risk of premature labor, premature rupture of membranes, placenta abruption, thinning or separation of the uterine incision, or pulmonary edema resulting from the use of tocolytic agent, and places a much greater burden on the mother in comparison with the endoscopic fetal surgery. Furthermore, no institutions in Japan currently implement fetal surgery with myelomeningocele. The Japan Fetal Therapy Group is currently implementing monitoring research in regard to treatment of infants after birth in Japan, and intends to continue its preparations for the future. In myelomeningocele cases, the spinal nerve is damaged due to being exposed to amniotic fluid within the uterus, along with contact with the uterine walls during fetal movement and uterine contractions. For this reason, the principle behind fetal surgery is to prevent such disorders. Furthermore, many myelomeningocele cases are accompanied by Arnord Chiari Ⅱ malformation and hydrocephalus caused thereby, and it is believed that surgery during the fetal stage can inhibit the progress of Chiari malformation. 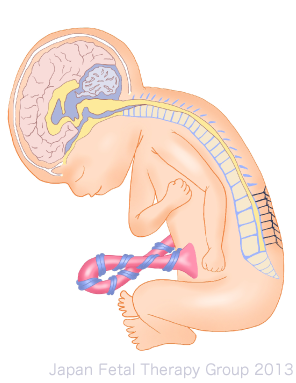 In Europe and the USA, inclusion criteria of fetal surgery were evidence of Chiari malformation, myelomeningocele with the upper boundary located between the first thoracic and the first sacral vertebra, maternal age of at least 18, gestation age of 19 weeks 0 days to 25 weeks 6 days, and normal chromosomes. Exclusion criteria were multiple pregnancies, fetal malformations unrelated to myelomeningocele, severe kyphosis, risk of preterm birth, high body-mass index, history of uterine surgery (classic cesarean sections), etc. The results of fetal therapy include a report of fetal therapy surgery in the USA, in the Management of Myelomeningocele Study (MOMS)1) published in 2011, and a report comparing the prognosis of cases in which treatment had been implemented after birth. There was a significant reduction in the number of infants requiring shunt procedures among those undergoing fetal surgery. The group undergoing fetal therapy had better motor function, and more of the group undergoing fetal surgery became capable of independent walking. At the same time, the group undergoing fetal surgery experienced higher rates of premature birth, as well as incidence of thinning or separation of the uterine incision at surgery, detachment of the amniotic membrane, oligohydramnios, placental abruption and pulmonary edema1). As can be seen here, fetal surgery on myelomeningocele has achieved a measure of success, but is a surgical procedure accompanied by high risks to the mother. It is believed, therefore, that patients to whom this form of therapy is applied should be selected with great care.